Fifty years after passage of the Fair Housing Act, segregated housing is still the norm in much of the nation. The Obama administration's 2015 Affirmatively Furthering Fair Housing rule (suspended last December by current HUD Secretary Ben Carson) nudged cities toward compliance with new resources and reporting and action requirements. Many municipalities responded with housing assessments and plans; Planning's April cover story, "Fair Housing at 50," zeroes in on a multi-jurisdictional effort under way in and around Kansas City, Missouri. Half a century after Lyndon B. Johnson signed the Fair Housing Act, Jake Blumgart tracks how far we've come — and how much further we still need to go. Sidebar by Josh Stephens. 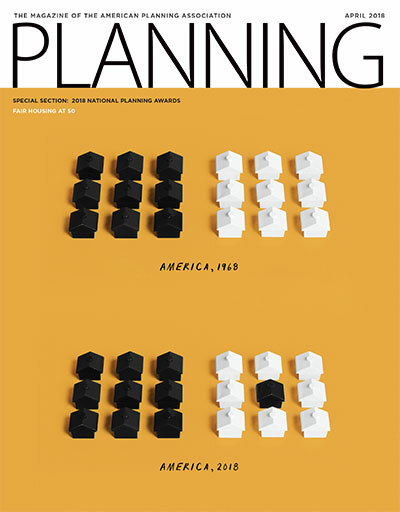 Planning celebrates the best and brightest in the planning profession. "Measuring Informal Housing Production in California Cities"
"Achieving Regional Housing Planning Objectives; Directing Affordable Housing to Jobs-Rich Neighborhoods in the San Francisco Bay Area"
A guest column by Mary Kay Peck. Member news and APA highlights in Planning's newest section. Smart phone apps for homeless counts, Trump's infrastructure plan, state-level net neutrality. Reid Ewing draws lessons from research on urban sprawl. Maryland, urban resiliency, zero-carbon buildings. Podcasts, Black Panther, Esri on Instagram. The LGBTQ community: planning's forgotten minority. Cover: Illustration by Matt Chase.